The most crucial element of any enjoyable stay for your guests is undoubtedly a great night’s sleep. That’s why we pride ourselves on supplying only the very best quality bed linen, luxury bedding and the highest standard of contract beds to ensure you always receive great value at a competitive price. For over 100 years, the fifth-generation family-run British bed manufacturers Hypnos have specialised in creating comfortable, durable beds with bespoke options to suit everyone’s style and budget. 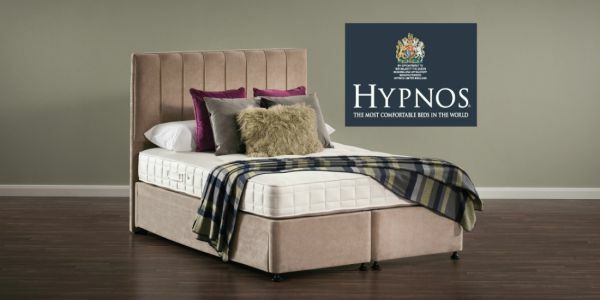 We’re delighted, therefore, to announce that we are now proud suppliers of Hypnos contract beds, renowned for being the most comfortable beds in the world. Every bed is lovingly handmade using sustainable materials and, with an effective combination of traditional skills and modern innovation, they are guaranteed to impress. Using state-of-the-art research to identify the key qualities of a good night’s sleep, Hypnos mattresses are skilfully crafted using pressure mapping science, pressure relieving springs and supportive natural, sustainable layers to create the perfect home-from-home sleep environment. We offer three Hypnos mattress styles for you to choose from, depending on your preferences and budget. The most luxurious of the three mattress options, the Lansdowne Cashmere mattress features 1600 pocket springs and generous layers of blended, sustainably sourced wool & cashmere and sustainable eOlus™ fibre. The eOlus™ fibre is manufactured using a crimped design, allowing air to easily pass through in order to actively regulate your guests’ body temperatures. 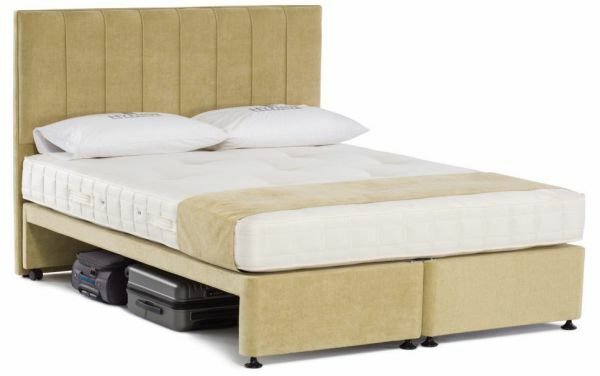 This 1000 pocket springs rotate only mattress has been specially manufactured to combine both convenience for housekeepers and comfort for guests, making it a popular choice amongst large-scale chain hotels. 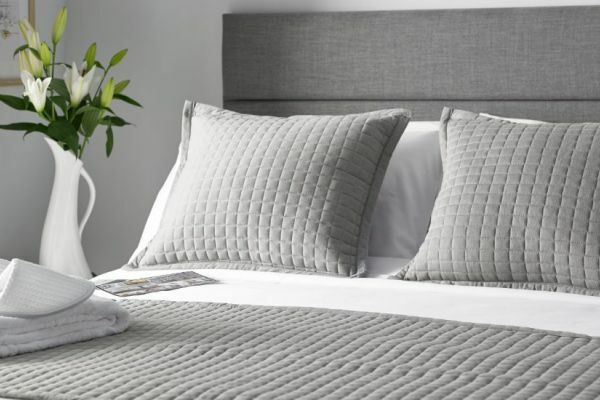 With polywool & silk blends layered with dual density polyester, the Beaumont Pillow Top offers support at the base and a sumptuously cosy top layer. 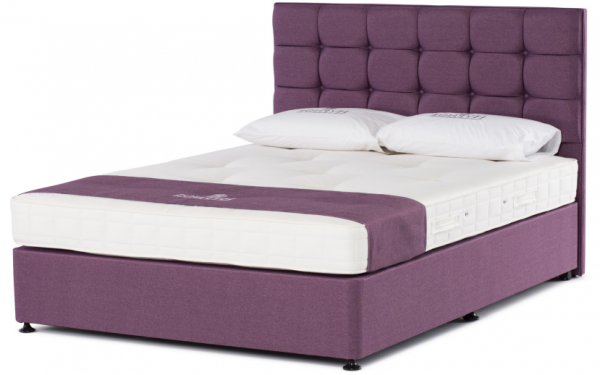 The most affordable of the Hypnos mattress range, the Cranborne, with its 800 pocket springs, has been carefully developed to effectively withstand the rigours of the hospitality industry. 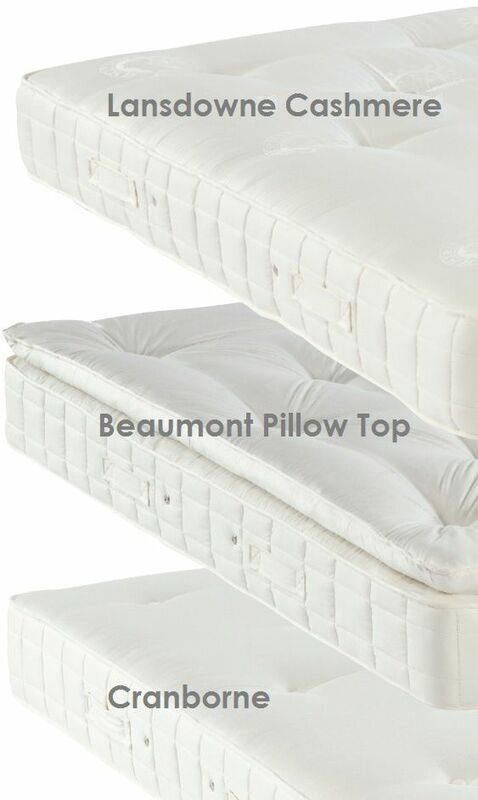 Featuring layers of polywool, dual density polyester and duo mixed fibres, these quality fills provide impressive levels of comfort whilst the use of pocket springs provides superior support over traditional open coil options. What makes B&Bs, holiday homes and hotels so diverse is that they all have their own unique style. That’s why our Hypnos range offers three different headboards for you to choose from, ensuring both quality and individual style when selecting the right beds for you, your guests and your establishment. All three of the headboard styles, Petra, Victoria or Grace, are available in a variety of colour and fabric choices, to ensure the entire process is tailored to suit your décor. The luxurious Grace headboard has three rows of deeply buttoned squares, measuring 131cm floor-to-top with a depth of 9cm. The stylish Petra headboard features subtle vertical piped detailing, measuring 131cm floor-to-top with a depth of 10cm. The modern Victoria headboard features two rows of 4 square segments, with a height of 161cm floor-to-top and a depth of 9cm. The FlexiBase™ offers versatility for both extra storage space or increasing occupancy. Where space is perhaps limited in a B&B or self-catering accommodation, or if your guests simply wish to tuck their cases out of sight during their stay, the FlexiBase™ has convenient under-bed storage which is an ideal size for luggage or suitcases. Alternatively, the opening can also be utilised as space for an extra bed, allowing you to accommodate more visitors. If you wish to use the under-bed space to store extra linen or bedding, the open space can also be concealed from sight with an aperture flap, measuring 29cm. The perfect foundation for any guest bed, the stylish ClassicBase™ is just that, classic. Ideal for any interior, the minimal base can be contrasted with a statement headboard or soft furnishings. The single-piece base can also be enhanced to a Zip & Link base, allowing you to optimise bookings with the option of two single beds or one super king size bed. Contract beds can suffer much more wear-and-tear than conventional beds, which is why Hypnos contract beds come with a 5-year guarantee to accommodate this. Hypnos are at the forefront when it comes to incorporating environmentally sound materials and sustainable practice into both their products and business philosophy. 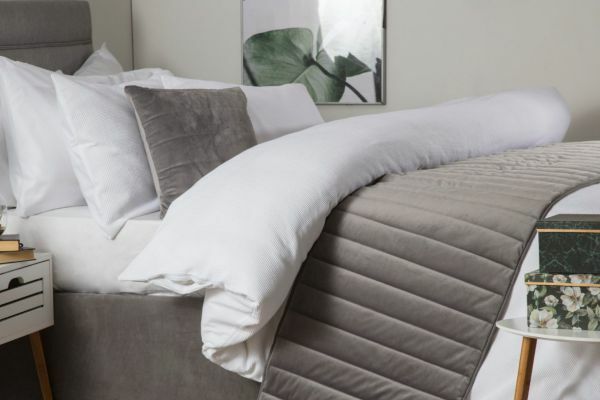 Most recently, Hypnos were crowned the winners of the Interiors Monthly Sustainability Award this year, and given their commitment to sustainability before, during and after their beds are manufactured, it isn’t hard to see why. For example, they use sustainable eOlus™ fibre, which is manufactured from recycled polymer-based bottles. As a way to combat their beds ending up in landfill, all Hypnos beds are 100% recyclable and they will even dispose of your old bedset in accordance with environmental legislation when delivering your brand-new beds for a nominal charge. Being specially made to suit the hospitality industry, Hypnos beds are not only manufactured to withstand rigorous commercial use, but are also treated to ensure ultimate hygiene and safety within your business. Hypnos contract beds conform to the latest fire safety standards: BS7177:2008 (Crib 5) / BS7176, with regular testing for compliance to guarantee they comply with the very highest standards of fire safety. 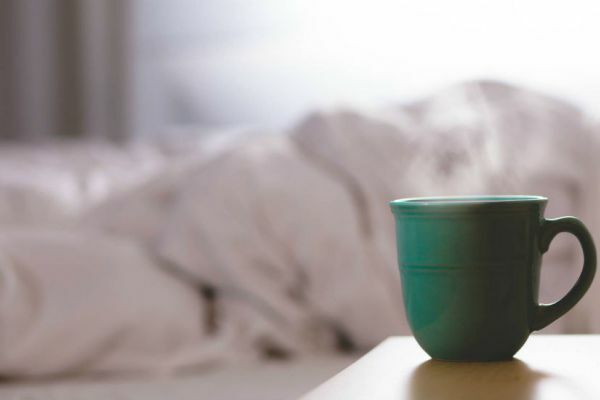 Secondly, each mattress is treated with an anti-bed bug, anti-dust mite and antibacterial & anti-fungal treatment to ensure your guests receive a restful, hygienic night's sleep. This not only protects your guests that may suffer from allergies, but eliminates the potential of you receiving a bad review, too. For all pricing enquiries please contact our Customer Services team on 01768 372 939. We’ve picked out some of our newest cushion collections, as well as some older favourites, to give you a helping hand when it comes to updating your look for the brighter seasons. Whether you’re a new B&B owner, or looking to give your property a revamp, there are a few things you can consider for a stress-free makeover.